It’s all energy. We’re swimming in energetic streams. We are connected to the movements of the cosmos and are all woven together in this intricate and multidimensional tapestry that is Life. There is a lot of charge in the air which could be wiping some of us out! Energy has been building toward this BLOODMOON~ LUNAR ECLIPSE in Aries, which is the final of the “rare” tetrad configuration that will culminate on September 27th. Passions will be stirring so we must take deep breaths, connect with the grounding energy of the Earth, and bring patience and love to our interactions/relationships. We can transmute the fire and rise to see a new dawn with an open and accepting heart. “With this last Aries Blood Moon Total Lunar Eclipse, it’s time to integrate the endings, awakenings, transformations and death and rebirth experiences related to the balance of Self and Other, completing our initiation into a more balanced exchange between the masculine and feminine energies of life as well as between women and men. “All new things start with our choices. Our free will is our greatest gift, and yet many people don’t use theirs. That’s when we get stuck in life and can’t seem to find a way out. “Being a victim entails not seeing options in our lives. We shut down on life. Being an optimist means that we see different opportunities and choices we can make. There are possibilities in life. “Lunar Eclipses occur when the shadow of the Earth moves across the face of the Moon, cutting off the sunlight. “Usually, full Moons help us become aware of something within us, some feeling or belief that we keep hidden. At a Lunar Eclipse, these feelings and beliefs come out unconsciously. You could say, our shadow is showing. “So look for your Shadow turning up this weekend, and instead of pushing it back into the Unconscious, embrace it, name it and allow it into your life. “This is the ultimate choice—stay open to all of yourself and own it. Then take it into your relationships and work consciously to include those rejected parts of yourself. “The Lunar Eclipse tends to symbolically super-charge the Full Moon energy. It will turn up the volume of emotions and highlight the issue that needs to be felt through and processed. “You may feel like you are losing the grip on controlling your temper or anger, so allow for a private safe space to move through it. “Unconscious aggression could be projected onto someone or an issue. Immature reactions could do damage and create a shut down rather than an open dialogue. “It is possible for an ending of a certain type of relationship (business or personal) or the way in which a relationship functions. The relationship where the giving and receiving is out of balance will be evident. “It may be about letting go of a stale emotional habit that goes against your healing and growth. It may be a realization of the pattern of co-dependency in a relationship and the time has come to break away from it or heal and be more independent. “Another possibility during this time, may be learning to work with your anger in a healthier way and expressing your assertiveness more frequently. “Sometimes the closure or endings happen through your choice and other times it may occur due to a series of life events that feel sudden. “Why does this happen? To wake you up. Perhaps you are dragging your feet or stuck in limbo regarding making a clear-cut decision and taking action. “During the Full Moon and Lunar Eclipse in Aries, it’s even possible that there may be a feeling of being out of control or powerless, whether it is presently occurring or due to an old issue from the past. More than likely, it is something from the past rising up again that needs closure or a clear choice. “We are in the Eclipse portal- which is a time of great transformation, change, endings and new beginnings. “First and foremost we want to dramatically change our relationship with ourselves- as anything we want or need or desire OUT THERE can only be fulfilled and truly experienced when we have found it IN HERE. “Any relationships that are on solid footing are fine- you may experience things that rock your boat, but if your ship does not have holes in it and you are both willing to do the work to row to a safe harbor you will be fine. “Lunar eclipses also tend to build things up to a point that things explode– hence the reason Full Moons are times of heightened emotion, more child births and more accidents (according to ER research). “Since this Full Moon Eclipse is in Aries, our Unconscious emotions and feelings around anger and rage and our immaturity, selfishness and tendency towards denial can arise to be confronted at this time. “This is no tall order and most certainly not all hearts and roses- but it can be quite profound and growth producing if we stay with the transformational energies and see them through. 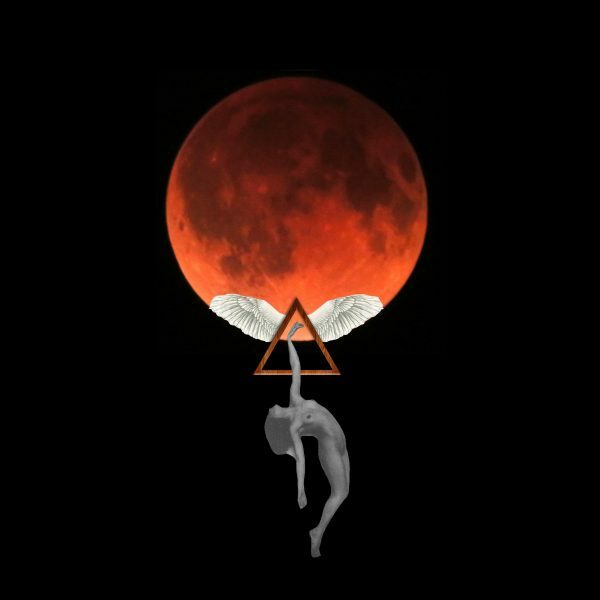 “In the final Total Lunar Eclipse chart we have lots of Divine Feminine archetypes involved in the eclipse dance- all adding their energies into the mix. The Sun in Libra is conjunct Juno (the Asteroid of partnership and marriage), Black Moon Lilith (the fierce, Dark Feminine), and the evolutionary North Node of destiny and growth. “All of these are opposite the Full Moon in Aries who is conjunct Vesta (the priestess Asteroid) and the karmic South Node that connects us to the past. “Carl Jung said ‘The meeting of two personalities is like the contact of two chemical substances: if there is any reaction, both are transformed.’ Here we see the triangle in action. When two things join together in Union a third entity is created. “The two bottom points of the triangle then connect in with the top point. Out of duality a trinity is born. We no longer have black and white- but we have grey. We no longer are just masculine or feminine but we are both/and and as such we are whole. “This Sabian symbol speaks to me of the potential during this 4th and Final Eclipse to find that wholeness within– which will then bring clarity to all other situations without. “When we operate from a place of lack within we keep looking outside for something to fill us and make us whole. But we when we come from a place of inner wholeness then the whole game changes. ‘He who looks outside dreams. He who looks inside awakens’ (Carl Jung). “…this time in astrology is really unprecedented. So many things are happening all at the same time- any one of which would be potent on it’s own, but in actuality they are all happening together in the same time frame. “The portal is open right now for amazing, exponential growth and karmic clearing. Of course we have to choose to walk through the portal- no one is going to push us through it or do the work for us. We have to show up and do the work ourselves. “We have to take responsibility for where we are at, where we are stuck and why we have chosen to remain stuck there- and then we have to get our butts into gear and get going. ‘on the road to enlightenment there are many tempting parking spaces’. get out of neutral and get going! SUPER *Blessings* to us all! You seem like a person of high wisdom. I love learning new things and consider myself that which you call awakened; it would be great to have a talk sometime because to me knowledge is power, and you seem to know a lot. Thanks. Thank you all for putting words, meanings, thoughts together for me. This has been and continues to be the most amazing year of MY lifetimes. The remembering, awakening, enlightening. Thank you for the confirmation. I really love your posts! But have you ever considered changing the font and color you use? I personally have trouble reading so much content with this font and light grey color…I don’t know if anyone else has this problem. I actually also have this problem – I do lots of squinting and my eyes get tired after a while. The light gray is just not contrasty enough. I appreciate all the efforts that went into this offering. Thank you so much. Gorgeous and helpful both. really enjoying reading your article! just wondering why you say ‘the North Node on the Galactic Center’ ? the galactic center is 26 degrees sagittarius as far as i understand it. right now the north node is at 1 degree libra in the tropical zodiac and 7 degrees virgo in the siderial zodiac. would you consider either of these to be on the galactic center? maybe i am not understanding it correctly? oh i see this is the post written by divine harmony, so i am asking divine harmony about this question. thanks so much! This is actually really interesting to me for a number of reasons, but one that I want to elaborate on further revolves around a tattoo I got earlier this year. I had spent some time trying to come up with a symbolic representation of both my birthday and myself (never once looking into astrology for advice, guidance, etc. )Anyway, my birthday is 3/27/87. This past year was my golden year (27 on 27) and I wanted to get the ink before turning 28. I ended up deciding on the numbers 1-27 in Roman Numerals circling a red triangle, with the lines of a nine pointed star behind the triangle. There was also a blank spot left in the numerals where looped back to 1. So I had the artist put a red dot there and it sits atop the triangle in the circle. if you have any thoughts on someone who has their Birthday on the up coming Blood moon, Lunar eclipse (me) I would greatly appreciate it. please email me privately, if you can. I am a bit scared, nervous, and I don’t want to be. my moon is in aries, I am a libra and have been accident prone before on full moons, and don’t want problems on my birthday or anytime really. Thank for this gathering and dissemination, I’m feeling this all ~ and simply knowing it’s not just my ‘stuff’ coming round again offers me a supporting limb to lean upon. May I heed the Clarion Call to Change! Why are all your user photos the same? this truly explains the “sudden” issues in my relationship. Blessing! Thank you so much for this insight…. It has been EXTREMELY helpful…. I liked the part about~~”find the wholeness within, and go deeply within”. And connected~~the Carl Jung quote. Grateful thanks to all of you. Ahh.. my 12-year-old is a sensetive.. now I get where the unusual anger is coming from. I hope this information will help him relax and learn…. Thanks for these beautiful astral insights. The past few weeks have been so perfectly aligned. And this week a lover came to me as I showed up in his dreams twice this week. It is an exquisite miracle. Thank you all- you are all pure bliss and you can have anything you desire. The love of my life was an Aries. We have known one another for over 27 years and reconnected over seven years ago. He died August 17th of this year and my heart is broken. I am a Libra. He has a fiery personality, yet sensitive bold and caring. I am calm one and balanced and strong. He loved loved my personality and I appreciated his without judgement. The lunar eclipse and the insights surrounding its coming is powerful in that it is time for me to begin anew, I see clearly now must transform my broken heart to a heart the is healing and filled with joy.Thank you the confirmation. It is time to get busy. Blessings to all! I too lost my love, my Aries this year. The description you gave of your love is the same description I give mine. the one we shared together. I was blessed to be given the chance to touch and be touched by such beauty. He is always with me. I still live in the love. Y’all are pretty dumb. You know that, right? Just let them share their hearts without judgment,ya big meanie. These postings on the lunar eclipse really hit home for what I’ve been experiencing in the past bit of time. I am grateful to have these experiences validated and for the extra guidance and suggestions provided for how to continue riding the waves in the coming days. Thanks Mystic Mamma! I hope something good comes. The last few years have sucked. And this last month has been an emotional roller-coaster. Someone I was in an intense relationship abruptly ended it because he met another woman who was OK with him going behind my back. They posted their new relationship 3 days after the break up. I have been torn apart over this and really hoping they get what is coming to them. I know that is negative.. But I know I didn’t deserve that. So I’m hoping some good energy comes my way…….i would also like to know how a Taurus specifically could be affected by this Eclipse/super moon? What kind of energy or whatever for this kind of situation as apposed to the stuff that was said about relationships in the article? This is a most helpful article. It really helped shed some light on some struggles my partner and I have been having lately. It helps me understand that it is all just part of the cosmos and I must bring myself to a calm and alow myself to ground and meditate on all the past things and let them go. Let things play out the way the univers has set up and pray that my partner and I will be strong through this shift. Than you again for sharing these beautiful words. Hallo! Tell me please how will affect lunar eclipse on me. Which events will happen? And all on my birthday…. Just a question. I am very much going to use this eclipse as a new beginning. I am going through and want to make a transformation in my life. I was planning on during lots of contemplation this evening and during the night. I was hoping to get outside and watch the eclipse happen. Maybe a silly question for you but what is view on staring at the moon for extended periods of time? I have heard in the past this is not a good idea. This is so insightful. I have experienced all that was referenced. I AM reflecting now. I feel the emotional intensity. My personal and business have come UP this month. The good bad and ugly. I am patient with my self now. And give other an opportunity to be. I have given less rope to the situations that hurt me and placed barriers were I had low ones before. I have changed. Love peace and kindness to all. I will be watching and meditating/praying for positve transformation and healing in all our hearts, and in the heart of our home herself-mama earth. I truly believe we all need loving healing from the scars inflicted by our culture so that the change is positive and joyful. Lets make a prayer chain around the world to help make it so! I’m in Wisconsin in the US. Where are you? I will try to draw energy the only way I know how tonight…and focus on my recovery…Pray toGod with all my heart that I am healed …or alive long enough to let my children know,,,and believe… that I will be going to a better place, and it will be a place where we will all meet at the end…and that energy hopefully, will generate into them so that will not be sad when I am gone..that they will go on the rest of this journey with thier beautiful, beautiful selves… and take a big fat bite out of life…bite them back boys!!! mama loves you. What a beautiful site this is!- my favorite resource at a time when we all could use the guidance. My Aquarian nature loves your collective offering, my Libran moon adores how balanced and brilliant each contribution is….you have mastered the art of synergy. Just had to say that I for one ADORE your graphic style (and I am a designer)- the font, the size, the colors, are all reflective of a high feminine essence that exemplifies this particular subject matter- would hate to see it change into something more mundane. Thank you from Santa Barbara California! I have a 6 year old daughter with autism and she is absolutely affected by the phases of the moon. I didn’t know about tonight’s lunar happenings although i should have known since she woke up at 2am and has been squealing and climbing anything climable for close to 11 hours now. Any advice on calming her? Hi Andrea, I have a friend who works with Autistic children and she says that spiritual music has a very calming effect on the kids she works with. Try putting on Snatam Kaur and Nirijan Kaur Kalsa. Blessings and love to you and your daughter . thanks for the re-cap and very very interesting to read! Wow! I cannot believe I found all of these comments. I feel great!!! My birthday is today, 9/27 and I want to know what this means being that the lunar eclipse is occurring tonight? 2014 into early 2015 was extremely difficult for me and I’m starting to have a better outlook on things. Maybe this is a birthday gift from the Universe? Sorry I spelled your name wrong. With a name like Anjelica you should have good luck. Thank you Mia and Kathy for the well wishes! I’m hopeful that this lunar eclipse brings me amazing things on my birthday and beyond. Thank You! Are you all putting your gemstone’s outside tonight for the supermoon? It’s so interesting to me that today is mine and my soon to be ex-husbands 7 year wedding anniversary (almost 12 years together) and there’s the last of four blood moons all about endings and new beginnings. I left him back at the beginning of August, he was a habitual liar and cheater. I have lost so many people that I cared about that I thought were friends BUT I know that my guides and the Angels are helping me to heal and clearing my path for me to finally fully become who I’m truly meant to be. I am so grateful for everything. This time has really cleared so much past hurt and I can feel the healing and am SO ready for my new beginning of embracing my destiny and finding the true love of my life. It’s time for this butterfly to emerge from her cocoon and finally spread her wings! Much love and light to everyone during this time and moving forward. Hi, I met a man who I am very attracted to but he is acting very difficult and starts withdrawing. I just backed out from friday morning but am hoping that this eclipse will change things for us. He is a Leo and I’m a saggitarian, both fire signs. There is very strong attraction but he does not want emotional connections and so is withdrawing. I am a tarot reader and have instincts but in his case, I draw up blank. My heart tells me this morning after the eclipse is where I will start finding change. Kindly guide. Thank you from my heart ..
My winged heart delights in thdse events that are macrocosmic and a reflection of our inner cores or hearts. I rise. My interpretation of the lunar eclipse is that our earth moves to shield the moon from the sun and protects woman and female child from fiery solar male energies. The moon is our Earth’s child. It regulates the tides, births, feminine energies and plant growth cycles. Fear not catastrophe, rejoice in the relationship that is here. May the Aries Moon begin a new cycle 4 times reinforced in the tetrad, we have cosmic protection cycles, let us start to create new ways with the shield and sword of Ariesto protect woman and helpless innocents with this precious visual reference of the Earth protecting its moon Bathe in moonlight and rejoice. Our moon is circling the Earth, polarizing us in peaceful energy. Thank you for the insight!! With Love! The amazing thing to ME is this is a time of reflection within ourselves and having the courage to address and change things that one knows within themselves are changes that NEED to take place. I have been dealing with an issue for a couple of years NOW but the funny thing is to finally make the change was a process. I never thought I would even make it to the place I am in right now but I am so grateful to be in a place NOW where I am READY to move forward I’m MY life. So at the end of the day it really is about YOU. Forgive and love yourself on a deeper level. Love and Light! Thank you so much for this and all of your amazing insights. I am a libra and will be 29 on the 25th. So on top of all these other intense energies I am also deep I’m the throes of my Saturn return!! Choices that I have been putting off for years are all rising to the surface of myself and demanding decision. Of course as a libra I am still incredibly indecisive even though deep down I know the changes that I need to make. It is terrifying to step into the unknown after staying in a place where I am comfortable but not happy for years. Blessings to you all in these powerful times! !